Third-grade alpaca with recycled yarn. 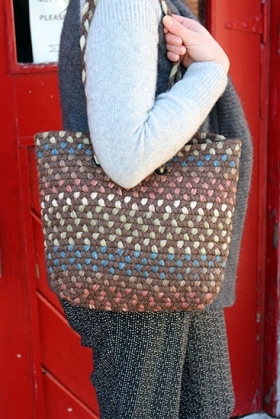 The mini alpaca tote is made from 2/3 U.S. alpaca yarn woven with 1/3 recycled yarn. Colors vary depending on the alpaca yarn and recycled yarn available. Approximately 14” wide by 13” tall, this tote is sized just right, not too big and not too small.